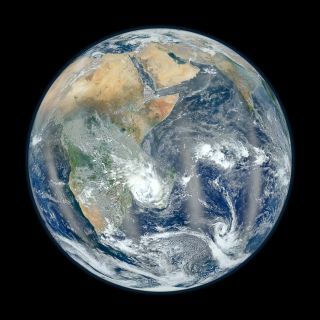 This photo from NASA's Suomi NPP satellite shows the Eastern Hemisphere of Earth in "Blue Marble" view. The photo, released Feb. 2, 2012, is a companion to a NASA image showing the Western Hemisphere in the same stunning detail. This photo was taken on Jan. 23. For nearly a century, scientists thought Earth shared the same general makeup as stony meteorites known as chondrites, coalescing as they did from the same cloud of gas and dust. Chondrites are the most common meteorites, chipped off the most common kind of asteroidin the inner asteroid belt. Earth was thought to have glommed together from chondritic matter that clustered into larger bodies over time. However, chondrites actually differ from what is known of the chemical makeup of Earth's uppermost layers. Researchers had suggested that for our planet to be similar to chondrites in composition overall, there must be hidden reservoirs of elements lying in Earth's deep, remote layers that account for these discrepancies. For instance, the ratio of the elements samarium to neodymium is higher in Earth's volcanic rocks than it is in chondrites. This led geologists to speculate there is a hidden reservoir of material at the boundary of Earth's core and mantle with a low samarium-to-neodymium ratio that balanced the higher ratio found in the upper layers. A major challenge to this notion of hidden reservoirs are mantle plumes,which are giant swells of hot rock emerging from near Earth's core. If these hidden reservoirs did exist, models of the Earth suggest that about 40 percent of the mantle's heat-producing elements — uranium, thorium and potassium — would be concentrated deep in the mantle. However, mantle plumes carry less than half as much heat upward as they should if such hidden reservoirs of heat-generating materials existed. A number of scientists now suggest that Earth is not similar overall to chondrites after all. They speculate the material that would help resolve these elemental imbalances got blasted off the planet in the final stages of its formation. Earth is thought to have originated from colliding bodies of ever-increasing size. By the time Earth reached a moderate size, its molten rock separated to develop a thin outer shell of basalt highly enriched in several elements, including the heat-producing elements uranium, potassium and thorium. "During collision, this basalt is lost, taking the enriched elements with it," Campbell said. This process of "collisional erosion" would then leave behind a planet quite different from chondrites in composition. "We think all large planetary bodies form by this process," Campbell said. "Their compositions will vary from planet to planet because the nature of the collisions will vary and therefore the amount of enriched outer shell lost will vary from case to case." However, this idea is not without weaknesses of its own. For example, if such material did get blasted off Earth, one might expect to see corresponding meteorites, but none with the compositions this model suggests have been seen, "and that is a problem," Campbell said. It is possible this material could have been captured by the sun or Jupiter, but this might seem like too convenient an answer. The only way to help solve this mystery may be to investigate rocks from the planet's core-mantle boundary brought close to the surface by mantle plumes. The researchers hope that the element ratios in these samples may reveal whether they match those of chondritic meteorites or those that would be expected if collisions had caused erosion during the Earth's formation. Campbell and Hugh O'Neill detail their research in the March 29 issue of the journal Nature.